Plug-in or wired lighting & audio control modules for your touring bike! 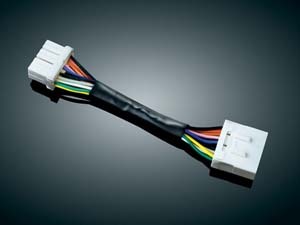 2208: Universal fitment for 12V applications. Adding multiple electronic accessories to your bike and need an easy solution? Our Accessory Fused Terminal is just the answer. No more stacked battery terminals. 20 amp main fuse protection. One 10 amp fused connection, two 5 amp fused connections. 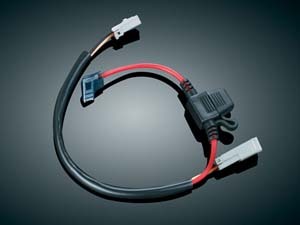 A must have when adding multiple 12V accessories. 3-1/2" long , 1-3/4" wide, 7/8" high. MS-P2: Plug and play installation for stock Harley-Davidson® LED Tour-Pak on 2014 to current Electra Glide®, Ultra, Road Glide® Ultra, and Tri Glide® models including CVOTM applies brake flash/strobe pattern to center Run/Brake portion of the Tour-Pak LEDs and allows left and right corner LEDs to flash/strobe when functioning as Run/Brake/Turn. Riders can easily select from 10 flash/strobe patterns by simply spinning the dial on the Magic Strobes Brake Light FlasherTM module! It has a sleek design and compact dimensions: 4.2" x 1.4" x 0.6". 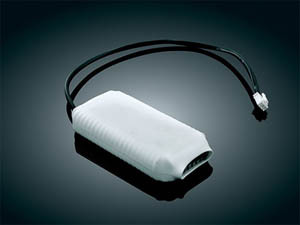 This unit will strobe the Tour-Pak only and can be used with or without our Magic StrobesTM BCM or Magic StrobesTM RSG to apply brake flash/strobe patterns to rear fender brake lights. TPC-1: Simple Plug and Play conversion to convert aLL of your Tour Pak® Lights to Run - Brake - Turn. Note: For proper operation of the TPC-1, low current draw LEDs MUST be used for the rear stock turn signals or the Tour Pack rear 1157 Bulbs. Bikes equipped with Tour Pak Side marker incandescent bulbs must be upgraded to LEDs. Greatly increases rear and side visibility of motorcycle by converting both side markers & tear taillights to Running, Brake, and Turn. Adds Turn signal functionality to rear Taillights; adds brake and turn signal functionality to Side Marker Lights. Requires previous installation of a Run-Brake-Turn Module (works will all brands of RBT controllers on the market today). Fits '02-'13 FLHTC, FLHTCU, and Touring models equipped with '02-'13-later-style Ultra Tour-Pak® or King Style Tour-Pak®. Does Not Fit 2010-2015 CVO™ Ultra Classic® Electric Glide® with OEM LED Tour Pak®. Bikes with our Panacea™ require special controller, please contact us by email for details. TPC-1T: Similar to above for 2010 - 2013 Trike. 5495: Take control of your passing lamps! The lamps are no longer automatically turned off when the headlamp is switched from low to high beam. Enabling the passing lamps to remain lit with the high beam greatly improves lighting. A must-have when upgrading lighting to our Phase 6 or Phase 7 L.E.D. Headlamps & Passing Lamps! Fits: '96-Up FLST Models and 97-Up Road Kings With Passing Lamps. 5496: Take control of your passing lamps! The lamps are no longer automatically turned off when the headlamp is switched from low to high beam. Enabling the passing lamps to remain lit with the high beam greatly improves lighting. A must-have when upgrading lighting to our Phase 6 or Phase 7 L.E.D. Headlamps & Passing Lamps! Fits: '98-up Electra Glide, Street Glide & Trike models with Passing Lamps. Note: Although this device has been designed to significantly increase your braking visibility, flash/strobe patterns may not be street legal. 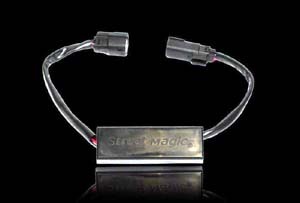 STR-HD: Similar to above but fits: Plug and Play on '96-'10 Softails (except Convertible, Rocker and Breakout), '97-'11 Dynas, '97-'13 Touring (Except '10-'13 Street Glide/Road Glide Custom), '99-'03 Sportsters, '10-'13 HD Trikes; '11-'13 Road Glide Ultra. 5492: Totally plug & play, with our 6-pin controller your brake lights automatically pulsate then remain brightly lit every time you apply the brakes. Design also allows easy connection of load equalizers if upgrading turn signals to L.E.D. Note: Provides 3 seconds of decelerating flashing brake lights. 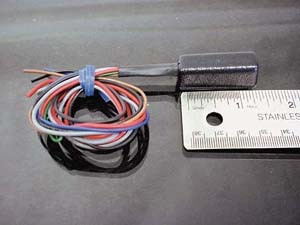 5497: A marvel of electronic wizardry, this module makes single filament or single circuit turn signals on the rear of the bike function as running lights, turn signals, and brake lights; not just brake/turn like our competitors! It can be used with our L.E.D. Silver Bullets, stock turn signals, or any single filament light you may already have installed on the rear of your bike. Completely plug-in for most '96-newer Harley-Davidsons with single filament turn signals and a taillight with running and brake functions. Compatible with '02-later H-D factory cruise control. Pulsing Brake feature can be turned on or off easily. For installation on earlier models or ’04-'13 Sportsters (except ’07-'13 XL1200N, ’10-'13 XL1200X, ’10-'13 XL88N), Kuryakyn adapters (P/N 4831 or 4832) are required and sold separately. 1. P/N’s 5497 is NOT the same controllers used in Panacea Systems. 2. P/N’s 5497 is not compatible with aftermarket or accessory modules that alter the functions of the stock taillight & turn signals. 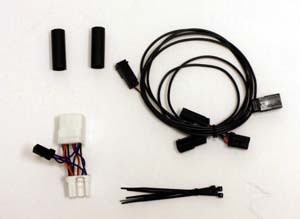 If you have already made modifications to your bike’s taillight &/or turn signals, you will have to return your bike to stock form before installing either of our Controllers. 5498: Self-Regulating Load Equalizer. Compatible with all H-D Factory Security Systems, this technologically advanced load equalizer won’t overheat, even when subjected to 4-way flashers, non-stop security system flashing while trailering, or when stuck at neverending red traffic lights. 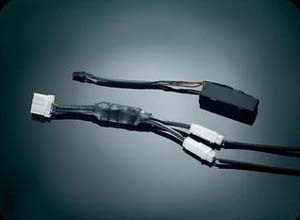 Plug-&-play when used with our Panacea Taillight, Run-Turn-Brake Controller, or Load Equalizer Adapters – can also be spliced in custom applications. BO-201: eGlideGoodies introduces an all new Brake Light Modulator with universal fitment. This compact aluminum housed modulator converts your ordinary brake light into an attention-grabbing visual alert device, creating more visibility when you are braking. With the modulator installed, applying your brakes will cause your brake light to automatically emit a visual alert signal of 4-8 short light flashes depending on what mode you select. There are four easy to set visual alert modes: Mode 0 = 4 Flashes then Solid Brake; Mode 1 = 4 Flashes then 4 Second Solid Brake with Repeating Pattern; Mode 2 = 8 Flashes then Solid Brake; and Mode 3 = 8 Flashes then 4 Second Solid Brake with Repeating Pattern. 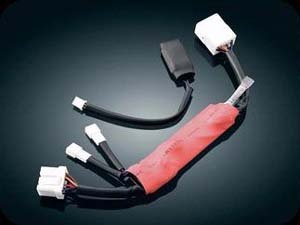 This Brake Light Modulator has a 10 amp capacity and attaches with double-sided adhesive tape and connects with supplied connectors. It is completely universal and a great product to have on your motorcycle to improve safety and visibility. BO-100: Be safe! Be seen! 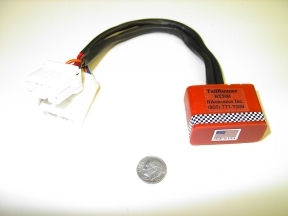 Maximize your brake light effectiveness with this compact electronic module that converts your ordinary brake light into an attention getting visibility and conspicuity when you are stopped or stopping. With this module installed, when you apply your brakes, it causes your brake light to automatically emit a visual alerting signal of 3 short light flashes, followed by 1 long flash (3.5 sec). The signal automatically repeats inself as long as the brakes are applied. This pattern is not random but has been selected because of its ability to retain the following drivers attention. BO-FLSH: This flasher module will work with any set of LEDs. It will allow them to function as a FLASHING tail and brake light. The brake light will flash 3 times per second for 5 seconds and then stay on steady. The module is 1/2" square by 1" long, allowing it to be easily concealed and has a peel-and-stick adhesive backing. For LED lights only. BT-600: Front Run-Turn Controller (ea). 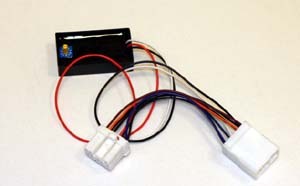 Another innovative design, this module plugs into the stock wiring harness and makes single filament custom lights function as running lights and turn signals. It works great with our Halogen Silver Bullets! One controller required per pair of lights. Fitment: '96-'08 Softails, '97-'05 Dynas, '97-'05 Electra Glides, Road Glides, '97-'06 Road Kings & '97-'10 Sportsters. BT-500: TailRunner adds running light capability to rear turn signals, even with single-filament bulbs! Fitment: 1997 and UP. 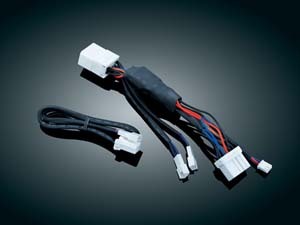 Compatible with the Harley-Davidson break light module. 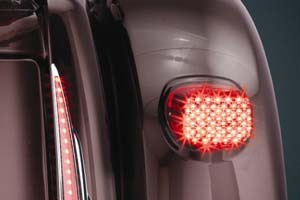 BT-400TS: TailStopper adds stop light function to rear turn signals. Fitment: 1997 and Up. BT-300: Taillight modules: TailStopper and TailRunner, designed to work together to give you running and brake light functions to rear turn signals, respecting full on and off for turn indication. Fitment: 1997 and Up. (Note: This is single module and not as pictured.) Also works flawless on new HD alarm optioned bikes. 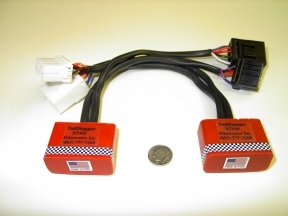 BT-803: SmartEqualizer is a micro-size 3-wire splice-in modern load balancer which allows installation of any custom turn signal light (including LED's), yet retain blinker & canceller function. Fitment: 1990-2000 model year. 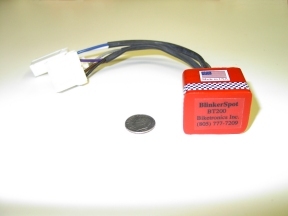 BT-802: SmartEqualizer module for new HD alarm optioned bikes as well as earlier models. Fitment: 1996-2000 model year. 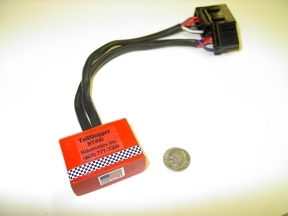 BT-801: SmartEqualizer module for new HD alarm optioned bikes as well as earlier models. Fitment: 2001 and up. SmartEqualizer is clearly superior - minimum heat with plug-in simplicity. BLF-SS6: Plug and play installation on 2010-2013 Harley-Davidson® Street Glide® and Road Glide® Custom applies brake flash/strobe patterns to stock incandescent bulbs or upgrade to LED bullet style run, brake, and turn signals. Riders can easily select from 10 flash/strobe patterns by simply spinning the dial on the Brake Light Flasher module! It has a sleek design and compact dimensions: 2.25" X 1.25" X 0.5". BLF-SS8: Plug and play installation on 2010-2012 Harley-Davidson® Street Glide® CVOTM, 2009 Road Glide® CVOTM, 2012-2013 Road Glide® Custom CVOTM and 2013 Road King® CVOTM applies brake flash/strobe pattern to OEM LED panel run, brake, and turn signals. Riders can easily select from 10 flash/strobe patterns by simply spinning the dial on the Magic StrobesTM Brake Light Flasher module! It has a sleek design and compact dimensions: 2.25" X 1.25" X 0.5". Although this device has been designed to significantly increase your braking visibility, flash/strobe patterns may not be street legal. BLF-HD: Plug and play installation on 1996-2010 Harley-Davidson® Softail® (Except Convertible, Rocker and Breakout®), 1997-2011 Dyna®, 1999-2003 Sportster®, 1997-2013 Harley-Davidson® Electra Glide, Ultra Classic, Ultra Limited models (including CVOTM), Road King (FLHR), and Road King Classic (FLHRC), 2006-2009 Street Glide (FLHX), 2003-2009 Road Glide Standard (FLTR), 2011-2013 Road Glide Ultra (FLTRU), Road Glide Ultra CVOTM (FLTRUSE), and 2010-2013 TriGlide®. Applies brake flash/strobe pattern to stock rear brake lights (does not flash Tour-Pak). Riders can easily select from 10 flash/strobe patterns by simply spinning the dial on the Brake Light Flasher module. BLF-CAN: Plug and play installation on 2011-2017 Harley-Davidson® Heritage Softail® Classic, Fat Boy, Fat Boy Lo, Fat Boy S, Cross Bones, Softail® Deluxe; 2012-2017 Dyna® Super Glide Custom, Fat Bob, Switchback, and Lo Rider applies brake flash/strobe pattern to stock rear brake light. Riders can easily select from 10 flash/strobe patterns by simply spinning the dial on the Brake Light Flasher module! It has a sleek design and compact dimensions: 2.25" x 1.25" x 0.5". Although this device has been designed to significantly increase your braking visibility, flash/strobe patterns may not be street legal. 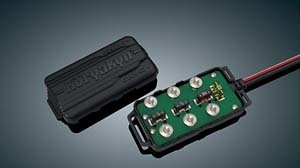 RAP-PTK: This small electronic module (about the size of a D battery) can be spliced into your existing air horn, tail light, or headlight circuit with built-in capabilities to make your ride safer. The pulsing effect causes your horn to pulse on/off at a speedy 7 times per second. This same effect can be used to pulse your brake light or headlight. Make your ride safer through horn noise, creating sure animal flight, and your lighting easier to see for automotive traffic. Plus your bike becomes even more of an attention getter at parades! Each module can pulse one accessory. To pulse multiple features, you will have to order more modules.